Quick Summary : Culinary Teas is another of my favorite places to order tea through. They have one of the largest selections of tea you'll find, all of which are top-notch quality. The pricing of teas at Culinary Teas is very competitive, about the same as you'll find at their competitor Adagio Teas . Culinary Teas also sells virtually all of their teas in sampler sizes, which come packaged in their space-age vacumn sealed, light-proof pouches. Most samplers cost $2 or less. 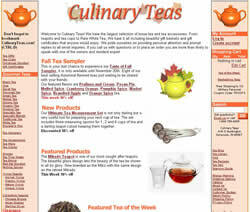 Culinary Teas has one of the largest selections of tea online. You'll find endless varieties of tea here, from standard, popular green teas to exotic flavored and herbal teas. Culinary Teas is definitely the place to go to "experiment" with new tea blends. And since virtually all of their teas are available in sampler sizes, you can try a huge variety of teas without breaking the bank. The quality of the leaves from Culinary Teas is excellent. While I don't like every tea I try, it's not the quality of the leaves that is at fault. It's just that I don't like the taste! Culinary Teas has an excellent website. It isn't as "pretty" as Adagio Teas website is, but the useability and ease of navigation is excellent. This is especailly important because they have such a large selection of teas - the easy and quick navigation makes finding these teas simple. I've only ordered once from Culinary Teas at the date of this writing (November 2006), but I have no complaints. All items I ordered were shipped and arrived promptly. Nothing was missing. Orders from Culinary Teas generally ship the next business day after the order is placed. So you won't be waiting forever for the teas to be shipped. Culinary Teas ships by UPS and offers free shipping (as of the date of this writing, but this may change) on orders of $75 or more. These free shipping orders are shipped by UPS ground, a bit slow perhaps - but you can at least track the progress. Expedited delivery is also available. Culinary Teas is also one of my favorite tea shops to order from. Due to the massive selection they have, I suspect they will be getting many orders from me in the future too. So, if you are in search of quality teas, at affordable prices - and especially if you want to experiment around with unique teas - hop on over to Culinary Teas, as it is an excellent online tea shop.